First single Leo Kupferman leads a potent singles trio as the Mounties head into the 2019 season. For both the Montclair High School boys tennis team and new head coach Guy Rabner, the boys’ timing is excellent. Timing is everything in tennis. A split second late on a swing, and you foul a serve, send a return awry or into the net. It’s excellent for a team that is peaking at exactly the right time to make some noise both inside North Jersey, Section 1 – Group 4 and likely come county and state tournaments. 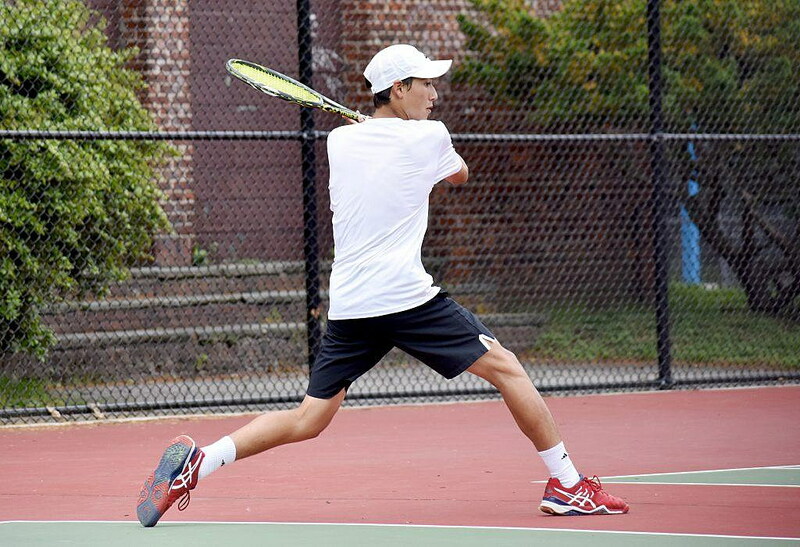 This is the year for senior Leo Kupferman, one of the best players in the state, to reach his potential as a Mountie and first singles player after a junior campaign where he took a massive step forward as a player. It’s a year for twins Andrew and Kevin Wallace to take that same next step during their junior year that Kupferman did. With Andrew as second single, and Kevin as third, the Mounties have a very talented and determined group of singles players, giving them a great leg up in meets. There’s also talent and leadership among the Mounties doubles players as well. Rabner has two seniors as his first doubles, with Charles Becker and Connor Piorkowski. “Both are good players and when playing well, they can beat top teams,” Rabner said. The two players are an interesting match, according to their coach, with Piorkowski’s intensity countered by Becker’s mild manner. The final doubles pairing is made up of junior DJ Finnell and freshman Sol Cornejo. As his team peaks on the court, Rabner’s timing was impeccable off it. A graduate of Montclair High School, where he was the first singles player as a senior in 1987, Rabner had been the head girls coach in Livingston some time back, and most recently coached Livingston’s middle school program. When the opportunity came up to coach at his old high school in his hometown, where his kids go to school, it was a no-brainer. The Mounties already had one tough test in opening up against the No. 2 team in the state, Newark Academy, on Monday. While they lost, Rabner said he liked the fight they showed, and he knows they’ll only continue to get better once the weather warms up and the season gets underway. They faced their next test on Wednesday—results after press time—when some of Rabner’s Livingston High School students welcome the Mounties to the LHS courts. Based on how they responded Wednesday night, Rabner will know whether his team will need more time to improve or if they’re right where they should be.